As might be seen from the output, the GCC version distributed by CentOS 7 is 4.8.5 which is not the latest version of GCC. You may also want to install gcc-c++. It will automatically include the C++ library and compile files with extensions that indicate they are C source as C++, instead of as C.
If you need a newer version of GCC than the one distributed by the official CentOS 7 repositories you can install it from source. Install bzip2 and run the ‘download_prerequisites’ script to download some prerequisites needed by GCC. You have to run this from the top level of the GCC source tree. Once it is completed, run the following command to compile the source code. It may take a few hours for the compilation to complete, so sit back and relax. After the compilation process is completed. You can check if GCC is properly installed. Of course, you don’t have to install GCC on CentOS 7, if you use one of our outsourced server support services, in which case you can simply ask our expert Linux admins to install GCC on your CentOS 7 server for you. They are available 24×7 and will take care of your request immediately. PS. 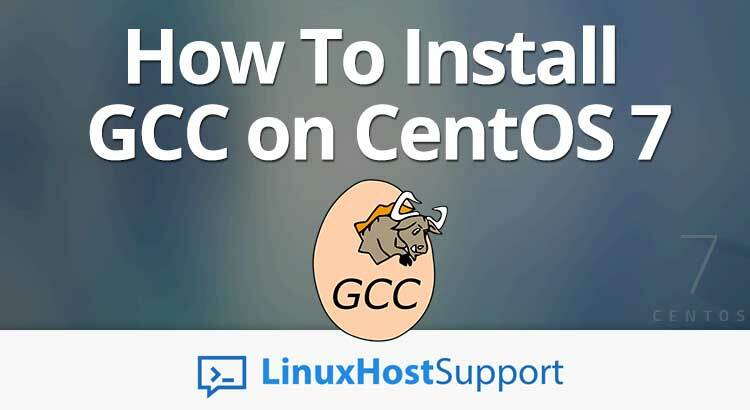 If you liked this post, on how to install GCC on CentOS 7, please share it with your friends on the social networks using the buttons on the left or simply leave a reply below. Thanks. What is IP_address, where do i find it, and what is Port_number and where do i find it, if you could provide an answer it would be awesome. This command is used to establish an SSH connection to a remote server. If you are doing this installation on your local computer, you can skip this part. The IP address is a unique numerical number assigned to every device connected to the Internet. The Port_number in this command refers to the port number of the SSH service which is running on your server. Usually, the default SSH port is set to 22. If you are not sure about the IP address and the SSH port number of your server you should contact your hosting provider and ask them for this information. please help me, I had tried many things and they didn’t work. You can install GNU Fortran using yum, RPM package or build it from source. Please check the official documentation for installation instructions. Hi, I’m not used to Linux much, but can you tell me why “It is highly recommended to start a screen session before starting the installation.” on Section 3? Thank you. This is because processes running in a screen session will continue to run even if the window is closed or you get disconnected. I followed your steps step by step but at the end there was an error. Did you run the ‘download_prerequisites’ script as described in the tutorial? Hi, I am wondering if the Gcc version needs to match with some specific kernel version? Or those two are independent? Thanks. There is a gcc minimum version required to build a specific kernel version. I followed your steps, and things seemed to go as expected, except there is a discrepancy between the version reported by gcc –version, which is 5.5.0 (the release I need for my client) and g++ -v, which reports 4.8.5. How do I make it so g++ links to the same compiler installation? The latest gcc and g++ version distributed by CentOS 7 is 4.8.5. If you would like to install a different version you would have to install it from source. I need a newer libm.so.6 … but after compilation those are not created …. do I have to use another make command to do that?